Tickets much be purchased in advance. Like several of his literary contemporaries (the Keats brothers, Hazlitt, Reynolds, John Wilson (‘Christopher North’), Clare and Moore), Byron was attracted to boxing. It was a powerful cultural phenomenon, especially among the aristocracy and the upper-classes, and fascinated the Prince Regent, who employed nineteen retired boxers at his coronation in 1821. 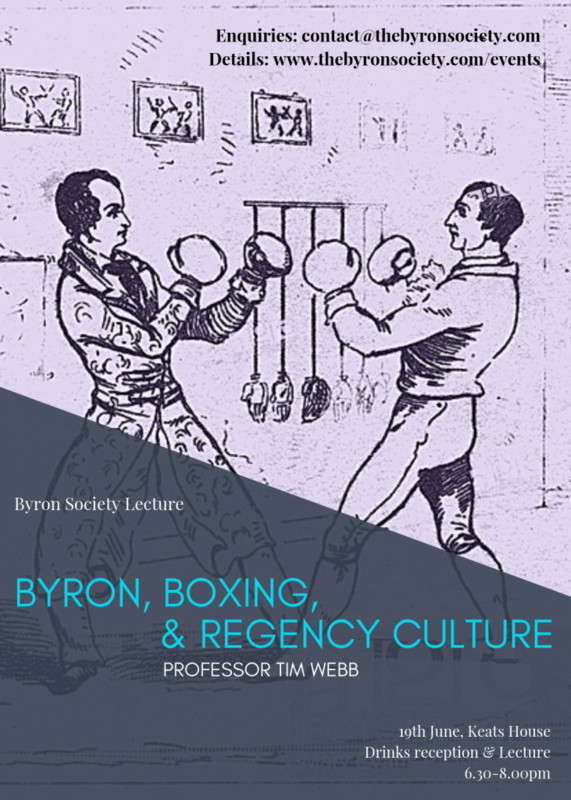 In this lecture, Professor Tim Webb explores the connections between Byron, Boxing and Regency Culture. According to Cobbett, boxing gave expression to virtues which were quintessentially English, although it was condemned as degrading and brutal by others, such as the Hunt brothers. Boxing (also frequently known as pugilism) brought Byron into contact with Tom Cribb and especially with the charismatic and handsome John Jackson, who for a time was Byron’s boxing coach and acted as one of his agents. Though Byron’s interest in boxing was at its strongest during his English years, it provided phrases and allusions in works of prose and verse and letters written in Italy, and continued to act as a powerful metaphor. There will be a dinner for those who wish to join, details will be confirmed closer to the time.